Johannes Vermeer, The Milkmaid (detail) (c 1658-1661), oil on canvas, 45.5 x 41 cm, The Rijksmuseum, Amsterdam. WikiArt. 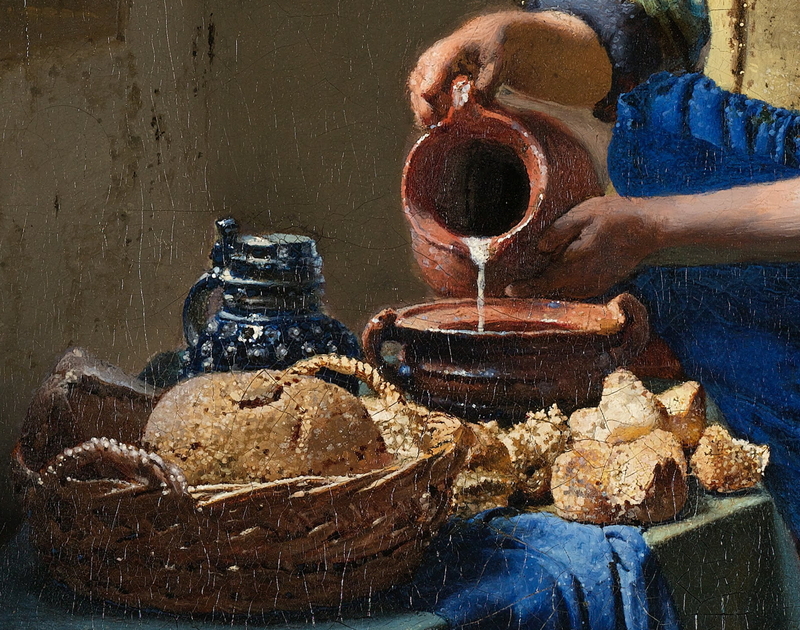 A beautifully lit painting showing a woman servant preparing food, within which is a still life of bread and pots, contrasting their textures and glistening glaze. A woman servant, kitchen or house maid, pouring milk from a jug, beside a tabletop with bread. In the left foreground the bread and pots rest on a folded Dutch octagonal table, covered with a mid-blue cloth. A wicker basket of bread is nearest the viewer, broken and smaller pieces of different types of bread behind and towards the woman, in the centre. Behind the bread is a dark blue studded mug with pewter lid, and just in front of the woman (to the right of the mug) a brown earthenware ‘Dutch oven’ pot into which the milk is being poured. An ultramarine blue cloth (matching the woman’s apron) rests at the edge of the table. The woman, seen in three-quarter view, wears working dress: a stiff, white linen cap, a yellow jacket laced at the front, a brilliant ultramarine blue apron, and a dull red skirt underneath. Her right hand holds the handle of a brown earthenware pitcher, which she supports from below with her left hand. Her work sleeves are pushed up to lay both her weathered forearms bare to the elbow. Her strong-featured face and eyes are cast down, watching the milk as it runs into the pot. At the left edge is a plain leaded window which casts daylight onto the scene. One of its panes is broken, leaving a small hole. Hanging high on the wall on the left is a wickerwork bread basket and a shiny brass pail. Immediately above them is a small dark form which could be a painting in a deep, dark wooden frame, at the top edge of the picture. The wall behind is white and bare apart from a couple of nails embedded towards its top, and several small holes where other nails once were. At its foot, at the bottom right, five Delft tiles run along the base. In front of those is a traditional foot-warmer, consisting of a metal coal holder inside a wooden case. The floor is dull red, with scattered detritus on it. Johannes Vermeer, The Milkmaid (c 1658-1661), oil on canvas, 45.5 x 41 cm, The Rijksmuseum, Amsterdam. WikiArt. The painting is light and simple, showing the servant peacefully preparing food in a well-lit corner of a kitchen. The bread on the table is finely textured with seeds, the glaze on the pots glistening in the light, contrasting with the smooth fabrics and flesh of the woman. The edges of her forearms are soft, suggesting movement. Patterns of fine cracks in the paint outline a rough rectangle on the bare wall which may reflect pentimenti (alterations), and there are faint darker marks at the base of the wall just above the tiles, which may also be pentimenti. The composition places bread, pots, the torso of the woman, and her head, all brightly lit and detailed, in a sweeping arc running from the lower left edge to the upper right centre of the painting. In contrast the upper quarter and right third of the painting contain little other than the bare wall. Further examination of the painting has revealed that there was originally a large map covering most of the back wall, which was later painted over to leave the wall almost bare. At the foot of that wall, Vermeer had originally painted a basket of clothes, but this too he painted over later, leaving just the foot-warmer and Delft tiles. A small depression in the paint just above the woman’s right hand marks the vanishing point used for its linear perspective projection, making it most unlikely that Vermeer used a camera obscura or other optical device in its production. This was one of the few paintings by Vermeer which retained critical approval after his death: it was praised by Sir Joshua Reynolds, and fetched a good price at auction in 1719. Vermeer was born in 1632, being baptised on 31 October of that year. 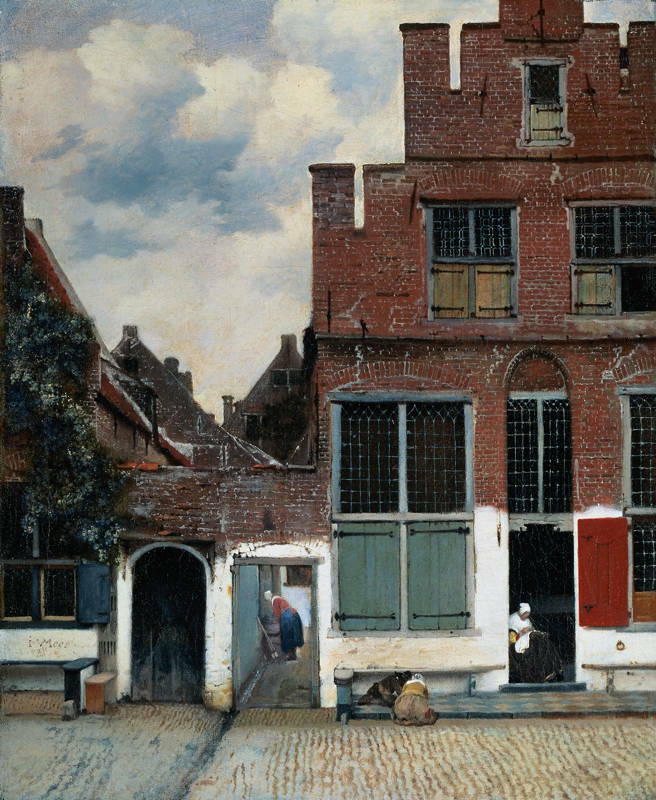 Brought up in a middle-class family with various business interests including an inn in Delft, it is not known whether he was apprenticed as a painter, and it is possible that he was largely self-taught. He became a member of the Guild of Saint Luke at the end of 1653, and was elected head of it in 1662. He appears to have enjoyed reasonable success with his paintings, although he seems to have been slow and meticulously in his work, and enjoyed local patronage but little recognition outside Delft. As with many others, his finances collapsed in the ‘Year of Disaster’ 1672, and he was forced to borrow money. He died on 15 December 1675, following which his possessions had to be auctioned to pay off his debts. He did not appear to have any apprentices or pupils, and soon after his death was largely forgotten outside a small circle of Dutch connoisseurs. He was rediscovered in 1860, since becoming one of the best-known painters in the Western world. Only 34 of his paintings are currently recognised today. Johannes Vermeer, The Little Street (c 1657-1661), oil on canvas, 54.3 x 44 cm, The Rijksmuseum, Amsterdam. WikiArt. Vermeer is best known for his series of paintings of middle-class women in rooms in his house, lit from the windows on the left of the painting. However he also painted two remarkable works showing the world outside his house: a view of Delft waterfront, and a townscape of a street and its occupants. Johannes Vermeer, View of Delft (c 1660-1), oil on canvas, 98.5 x 117.5 cm, Koninklijk Kabinet van Schilderijen, Mauritshuis, The Hague. WikiArt. Early in his career the women depicted were different, with three paintings showing servants rather than the well-dressed ladies of later. It is likely that this change was the result of the preferences of his patrons and customers. It culminated in what many consider to be Vermeer’s greatest work, The Art of Painting (c 1662-8), which was not only a showpiece intended to impress potential patrons and customers, but was also the work which Vermeer himself loved most. Johannes Vermeer, The Art of Painting (c 1662-8), oil on canvas, 120 x 100 cm, Kunsthistorisches Museum, Vienna. WikiArt. From the evidence of the small number of paintings by Vermeer which have survived (and are accepted as being true Vermeers), he was not a great innovator in the manner of Rembrandt, but what he did was painted so supremely well that he merits the high regard in which he is now held. One technique which he used very effectively was the ‘soft focus’ of wet-in-wet painting in oils. This gives him fine control over the crispness of edges and details, and he establishes a hierarchy of edges which was not fully exploited again until the late nineteenth century, by the likes of Anders Zorn. Johannes Vermeer, Woman Holding a Balance (c 1662-5), oil on canvas, 42.5 x 38 cm, The National Gallery of Art, Washington DC. WikiArt. 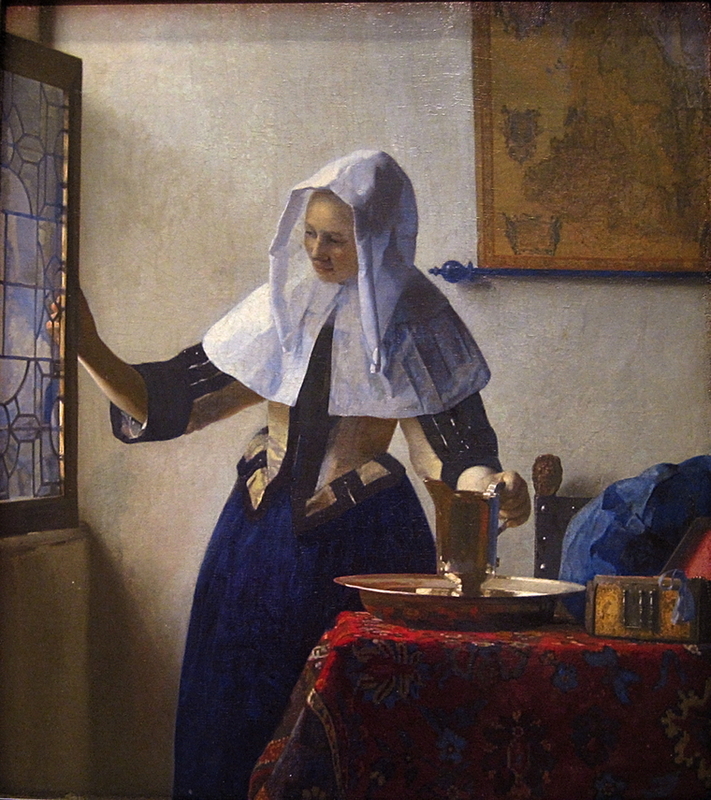 Recently several claims have been made that Vermeer used a camera obscura or similar optical device to draw or paint directly details in his paintings. Although it is impossible to prove the case one way or the other, many of Vermeer’s paintings have small holes or depressions at or near their vanishing point, which he almost certainly used to control their linear perspective. 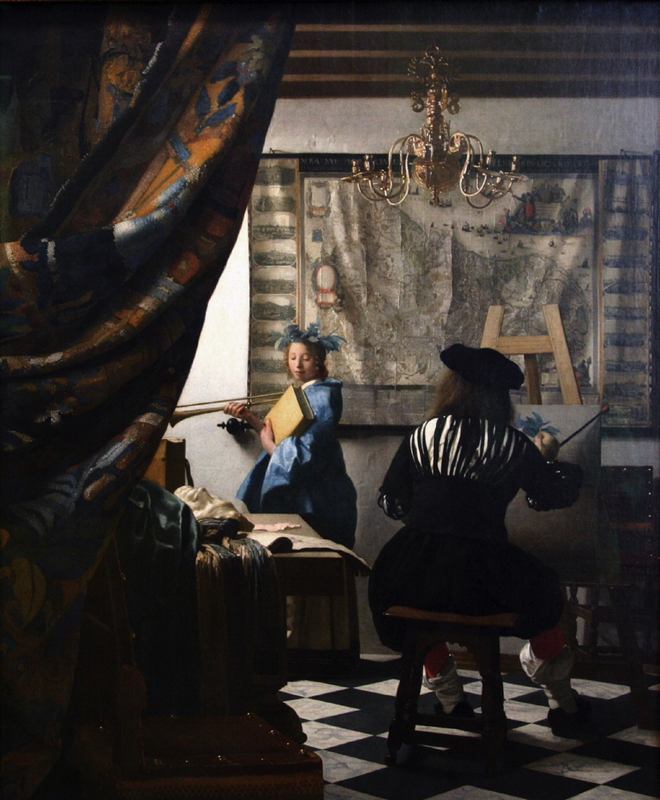 It appears highly improbable that any painter with the obvious skills of Vermeer would use both that traditional technique for perspective and a camera obscura in the same painting. Indeed when his paintings are examined more thoroughly, the case for use of a camera obscura appears generally very weak, however sensational it might seem. 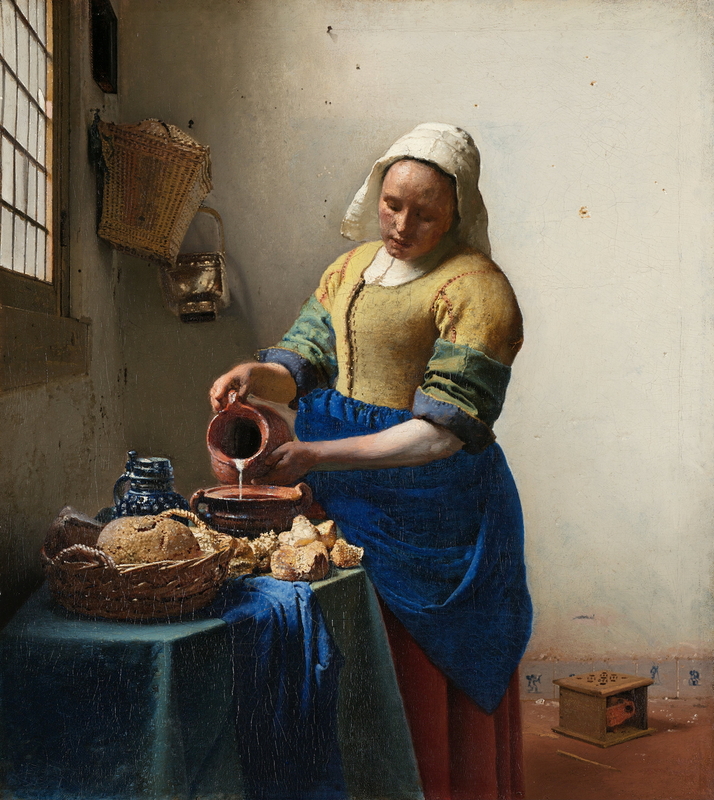 The Milkmaid is Vermeer at his very best. He uses light and dark to great effect without the extreme of chiaroscuro. He combines a still life which could have been a successful painting in its own right, with an exemplary study of the figure of a working woman. He controls the crispness of his edges to convey the texture of bread and light on glaze, against the softness and movement of skin and clothing. There are also some puzzles. Why did Vermeer make so much of the painting bare white wall, when he removed the map and basket of clothing? Some have tried to interpret the map in The Art of Painting in symbolic terms; was its removal here something more meaningful, or just an artistic choice? Johannes Vermeer, A Young Woman with a Water Pitcher (c 1662-5), oil on canvas, 45.7 x 40.6 cm, The Metropolitan Museum of Art, New York. WikiArt. Others offer us two very different settings for this work. One says that it is about a working woman going about making, perhaps, bread pudding, an image in sympathy with her lot in life. The other claims sexual symbolism in the jug, foot-warmer, Cupid figure on a Delft tile, and even her bare forearms, making her the centre of male lust and bawdy stories. I prefer to see what is there: a domestic scene, sensitively portrayed. This is the sort of subject that enjoyed greater popularity in the late nineteenth century, at the hands of Berthe Morisot, perhaps, with some of the bare, white walls of Wilhelm Hammershøi. 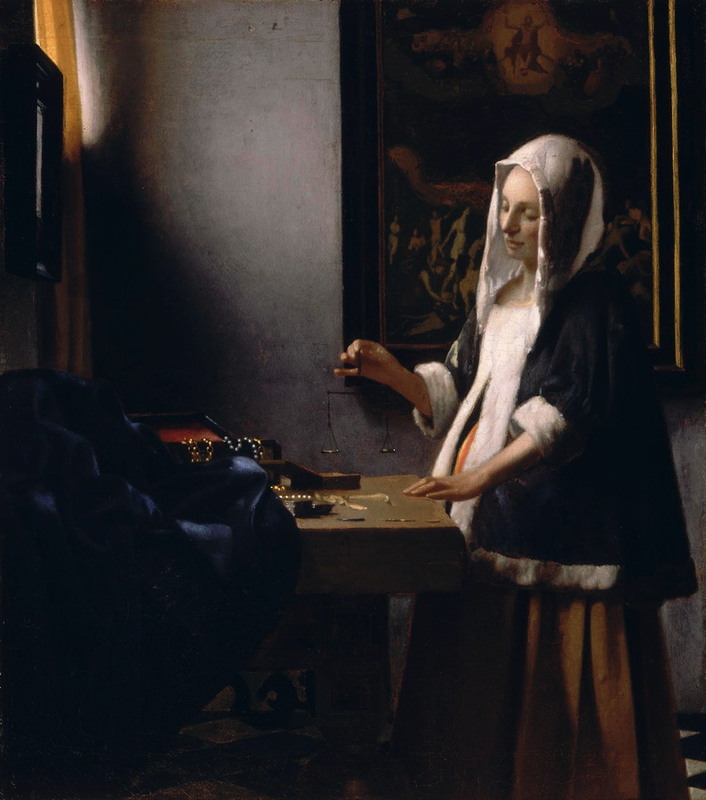 Whatever you think, Vermeer painted it like no one else could – absolutely and exquisitely. 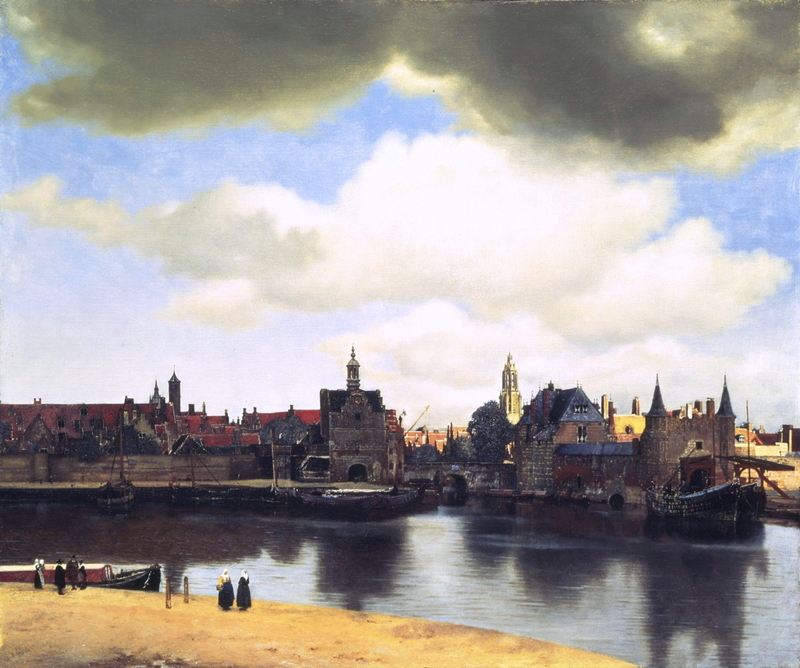 Vermeer’s popularity in the last century has ensured extensive supporting material. The following is a small selection of what I think is the very best. Alain Jaubert, Palettes DVD: Le siècle d’or des Pays-Bas, Le grain de la lumière, Editions Montparnasse. (A complete 30 minute programme in this superb series, featuring another of Vermeer’s paintings.) Details. There are several other DVDs in art series which cover Vermeer and various of his paintings. These include the programme on The Art of Painting in the Private Life of a Masterpiece series, which is well worth watching. The fictional Girl with a Pearl Earring (1999), written by Tracy Chevalier, and available as a movie under the same title (2003), is also well worth watching, although most aspects of it are speculative rather than fact. Posted in Painting and tagged camera obscura, domestic scene, Milkmaid, painting, perspective, Vermeer. Bookmark the permalink. What do you make of the “interesting” area between the right arm and pitcher? Is this a flaw I’m restoration or a fragment remainder from the map? I don’t know. It is tempting to read it as Vermeer’s original painting, but I think you’d need close examination, X ray, and IR before you could form a meaningful opinion. If anyone else knows of any evidence, please comment; otherwise I will look through my Vermeer books and see if the examinations have been performed. I’m sorry to say that there are no records to suggest that Vermeer ever painted in watercolour. I suspect that what you have is a copy. Some copies are wonderful: if it’s a good painting, it should still be enjoyed. Rarely you may find the copy was made by a known artist, for example when they were learning. In those circumstances copies can be worth reasonable amounts. If you want to have any painting valued, then I suggest that you get a good digital image made of it, and contact a local art museum or gallery and ask if they can provide advice.